What I hoped for. Thanks. These coins were still current the first time I saw one, brought back by a neighbor from a visit. As an American kid who liked our own somewhat chunky nickel--although it was past its prime even then--the big British threepence was an immediate cause for envy. AD 1160. So long ago. The Arabs could still occasionally be innovative in those days. The twelve-sided "threepenny bit" (threepence coin) was my favourite coin when I was a child in 1960s Britain. So, we have the same choice. The difference being that I like this coin sitting here in India. Below is a round 1937 Brazil 2000-reis...there is a 24-sided version of this coin. Here is Brazil's 24-sided 2000-reis of 1937-38, with this piece being the much more common 1938. There is a point at which the sides of a polygon begin adding up to a circle, and I think maybe with this coin we're beginning to get close. There is a point at which the sides of a polygon begin adding up to a circle, and I think maybe with this coin we're beginning to get close. Yes, I think your 24-sided coin must be the one that gets into the Numismatic Guinness Book of Records. So, the threepence has fans all over the world. Throughout my life in Britain, we have always had at least one polygonal coin in circulation. The threepence was withdrawn in 1971 when we changed to the decimal system. However, the heptagonal 50p coin was introduced in 1969, to replace the ten shilling note and teach us about (and get us used to) the decimal system. So when the threepence disappeared, we still had another polygonal coin in circulation. The 50p reverse design was created by Christopher Ironside. In 1982, a new UK circulation coin and denomination was introduced: the 20p coin, which was heptagonal, like the 50p coin. This polygonal coin had a connection with another polygonal coin, the old brass threepence. Both were designed by William Gardner. Look closely at the two images, and you will see his initials, "W G". This Tuvalu coin is the only nonagon I can think of. Guess it depends on what coins one is interested in. All Austrian €5 pieces are nonagonal. In this topic, I am interested in all candidates. Those Austrian coins have fine designs. Because I now restrict myself to circulation coins, I don't have any in my collection. Well, I spent a few minutes in the forum trying to find one to link to, so that you can see how classy they look. In India, we have 11 sided coins for all the circulating 2 rupee coins. Classy. As for other polygons, the first square coins I saw were from India. They fascinated me as much as our threepence intrigued you. 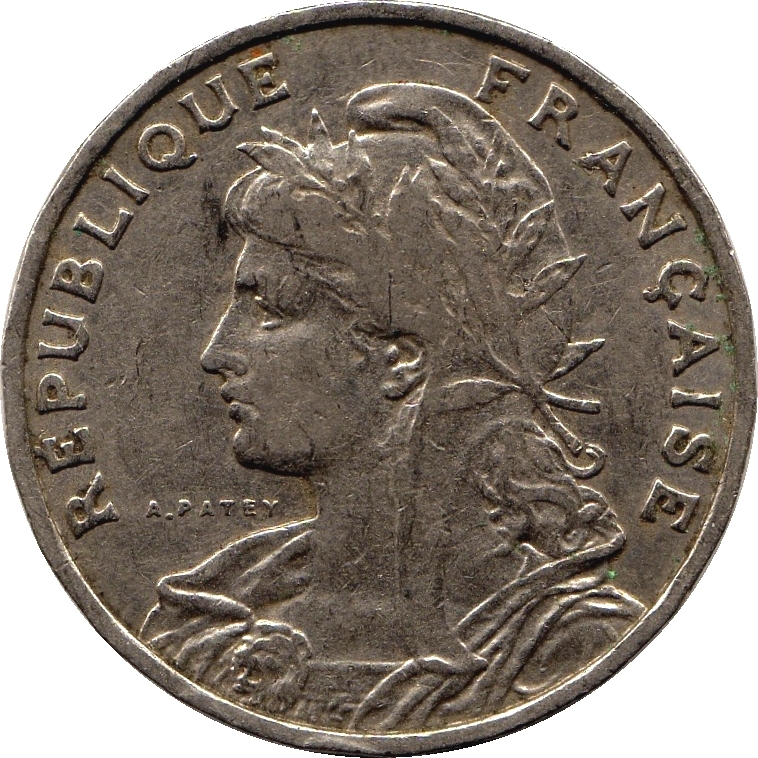 Guadeloupe 1 Franc (1903) has 20 sides. From which I learnt about the French 25 centimes of 1904-8. If you look very closely, you see that it has 22 sides. 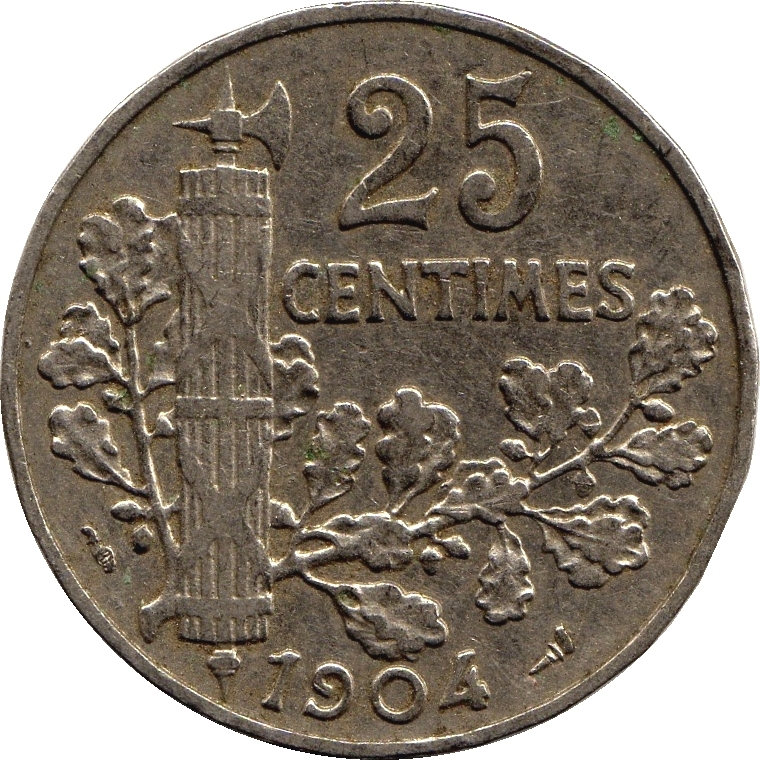 After seeing Bimat's excellent Guadeloupe 1903 1-franc, I am going to go do something I've never done: count the sides of the contemporary (1904-05) French 25-centimes. And I ask, seeing as we've been talking elsewhere of center-holed pennies, what about interior polygons? Cash coins with square holes come immediately to mind, but except for some tokens, I'm drawing a blank as to other shapes. The earliest examples of an intentionally polygonal coin in what is now the UK are the Civil War siege pieces. Below is a diamond-shaped shilling struck by the Royalist defenders of the Nottinghamshire town of Newark in 1645/6 (picture from Tony Clayton's site). There was a ninepence and a half crown in the same 'series', IIRC. I share coffeetime's admiration of the UK's heptagonal coins, and I like the 1982-2008 20p the best of our standard circulation coinage since 1971. When it comes to tokens, there are many more variants to investigate. I have several similar to the one below; it's hard to determine how many sides it's got! I'm sure I've also got one of a similar shape to the Brookbanks one but which is bimetallic, with the central part being an irregular shape (possibly a letter of the alphabet), but I can't find my record of it to plug it into Google for an image. Little surprised you decided to showcase a fake Rs 2 coin ?! In fact, I inserted the image from the Google Search results. I never noticed that there is something wrong with this coin.